Book by Martin Grams, Jr. 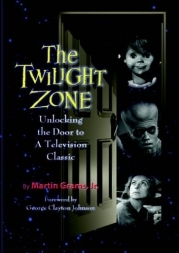 Author Martin Grams, Jr. has published “The Twilight Zone: Unlocking the Door to a Television Classic”, an 800-pager that contains not only episode details for even the most earnest fans but also plot synopses that should be of interest to writers of SF/Fantasay/Horror. The book also features exclusive memories from cast and crew as well as production details. To read an excerpt and for more details, visit www.martingrams.com (the link to the book is on the left side of his website).